Are you one of those individuals who can’t get enough of buying jewelry? Who doesn’t like to buy some jewelry? Especially women, a majority of the women have a special place for jewelry in their heart. For this specific gender, there is no such thing like having enough jewelry. And if the jewelry consists of a gemstone, then happiness reaches a whole new level. Who would not like to have a beautiful gemstone? Be it placed in a piece of jewelry or just buying it lose, no one would miss a chance of buying a gemstone. Even in the natural state, gemstones look visually alluring and enticing. You can find so many places where you will easily get your hands on the fascinating gemstones. Nowadays, it is quite easy to find an esteemed gemstone jewelry shop where you can easily find the desired gemstone. 1. Do some research: The very first that is obligatory for everyone to do is do your homework by just conducting research. It’s good to be two steps ahead of the whole process. You can begin your research by search online or going to various jewelry shops and look around. It would be great if you go with someone who has knowledge about the concerned gemstone that you wish to buy or brought it earlier. Prepare a list of questions that you want to ask the gemstone seller. A reliable will not shy away from answering the questions honestly. A reputable seller will try to build trust by giving the negating all your doubts by equipping you with the relevant explanation. If you know any trustworthy jeweler from whom you buy jewelry on a regular basis, then you ask questions from him too. When it comes to expensive things like gemstones, then you need to ride safely. You don’t want to get your money wasted on fake things. Make sure that a shop from where you will be going to buy gemstone has a rock-solid reputation in the market. You can check a reputation by looking at the store’s or jeweler’s online portal. One can go through all the testimonials given by the clients and reviews written by the customers. 2. Avail a guarantee for your gemstone: If you have found a reliable jeweler who will be ready to give a guarantee on the gemstones through certification, then it’s a successful beginning. This is great because you are aware that you are giving money for an authentic gemstone, even if you are paying a little bit more than your budget. Do not forget to ask about the returns. Some jewelers may have a policy which allows a customer to return a stone within a year. 3. Have a closer look: You will want to see your gemstone closely and maybe even under a special microscope. Many jewelers offer you to see a gemstone under a special microscope so that you can every little detail of it. The imperfections present in it reflects its uniqueness which also adds character to it. Knowing every detail of it will also let you recognize it easily if you give it for repair. This is a great way to tell about your favorite stones and cuts are. Do not forget to consider the imperfections. Imperfections in gemstones are quite common because real stones incorporate flaws and they are extracted from the lap of nature. Glass can be perfect and flawless, but gemstones are not. 4. Personalize designed settings for gemstones: If you are not willing to purchase a gemstone studded in some jewelry, then you can always buy a loose gemstone and get it set in an impeccable setting of your preference. The settings can appear odd without their stones, but always ask your jeweler if he is ready to show you what he has. Your personal choice always matters a lot for such important and expensive things. If you want a gemstone for some special occasion, then always plan ahead of it. Planning in advance will give you time to find and create a piece that you wish to have. 5. Do you want a natural stone or treated one? An inclusive variety of gemstones out there is enough to make your heart skip a beat. Many of us love wonderful stones, but do you know that they are often treated with heat, dye or created in a laboratory? Yes, it is true that many stones have gone through irradiation, heat, dyeing, or coating so that their appearances can be enhanced. In addition to this, such processes will also bring out fascinating hues of the stones. 6. Wrong gemstone: Generally buyers have a specific gemstone in mind while planning to shop for one. If you are aware of a concerned gemstone you wish to buy, then do the required legwork and excerpt all the details about it. Identify about its purity, how to judge its worth and choose the one with best cuts. 7. Honest pricing: Do not go to the first shop that you have inquired for buying gemstone. Always roam around, find a different jeweler, and compare prices. Comparing prices is one of the most important steps because doing this will inform you about the store where you can find the desired gemstone within your budget. Always stick to a budget. There is no harm in paying a little bit more for a thing that is too good to be true. But, over-spending can burn a big hole in your pocket which no one would ever want. Having a budget will help you to avoid any financial crisis. It is not possible for all of us to spot a fake gemstone as many of us are the student of gemology or experts. It is obligatory to only visit reputable stores. In case of any doubt or confusion, some people always choose to get a stone tested. There is no harm in doing a bit of window shopping. An employee, friend, or a family member may be able to assist you in finding a genuine gemstone. You can ask as many questions as you want. Gemstone complementing your outfit augments your overall beauty and renders you an enchanted touch to your entire personality. But, this only happens when you choose an accurate jewel to adorn yourself with. Above are the all-important tips that you need to follow before getting your hands on the best gemstones. These tips can be a life savior. 1. Ask her/his choice: Remember that you are buying a ring for your partner. The ring you will choose will not just signify your love, but also represents your togetherness. Always ask your partner’s preferences so that you will make your partner happy. Your partner will wear that ring for his/her entire life so make sure that you are buying an appropriate ring. 2. 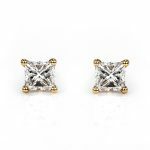 Diamond or cubic zirconia (CZ): Nowadays, cubic zirconia is gaining popularity in the market. It is used in place of real diamond so that the whole cost of the ring can be decreased. It is cost-effective than diamond. Many of us aren’t unable to distinguish between real diamond and cubic zirconia. Both of them appear to be similar, but in reality, they are not. It’s entirely upon the buyer whether they want to buy a real diamond or CZ. If you are looking for the cost-proficient option, then CZ is one of the best options. 3. Offline or online: In this contemporary era, it is no longer a piece of news that many of us are relying upon online shopping. 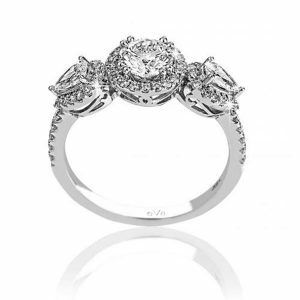 Many of us do not have time to go out and look for a reliable store from where they can buy an ideal engagement ring. Many online jewelry stores offer rings at a massive discount. Before buying a ring, make sure that you are you have made a comparison between different online stores. In addition to this, make sure to check the reputation of an online portal from where you are thinking to buy a ring. 4. Shape: Determine the shape of the diamond that you want on your ring. You can find various shapes of diamonds in the market. You have to make mind what type of diamond you wish to buy. If you are not sure about the shape, then feel free to ask your partner regarding it. We all want to make our loved ones happy. When it comes to a life partner, then we always want to do something extra for him/her. Surprise and propose your partner with the most amazing ring.